President Ibrahim Mohamed Solih appointed eight new Deputy Ministers to seven different ministries, on Sunday. 5. Deputy Minister of Transport and Civil Aviation- Hamadh Abdul Ghanee. 6. Deputy Minister of Arts Culture and Heritage - Ahmed Muhsin. 7. Deputy Minister of Economic Development- Hussain Zamir. Deputy Ministers are paid a monthly salary of MVR 35,500, comprising MVR 20,500 as basic salary and MVR 15,000 as allowance. 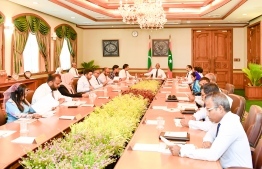 The government has appointed more than 50 Deputy Ministries since President Solih came into office on November 17.